Congratulations to Lexi Martone for winning this week’s Super Heroes & Villains challenge. This is Lexi’s fourth win! We absolutely love the cute, quirky nail design. 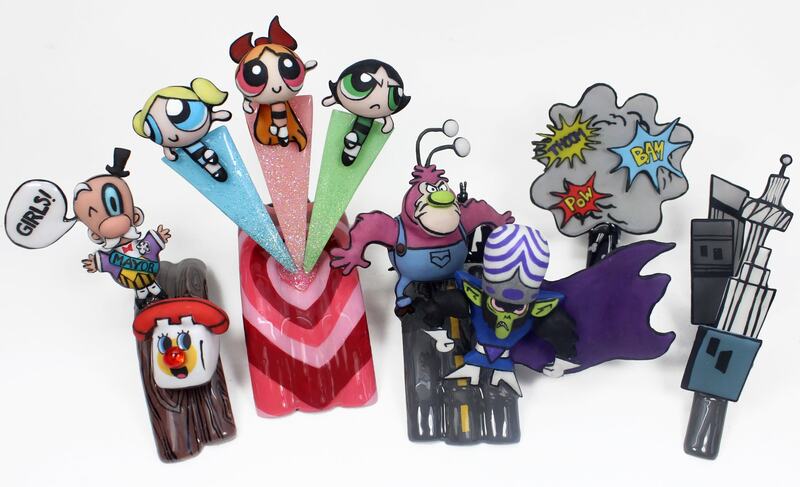 The Power Puff Girls, the mayor, and the villains are perfectly sculpted with an insane amount of detailing. Comic style illustration and 3-D sculpting on nails doesn’t get better than this. The black outlines give these nails their comic book feeling. Lexi instinctively knows how to create all the elements in the correct proportions to each other and the right color combinations. The result is that the eye can immediately take in all the separate details as a whole. Smart use of nail tip backgrounds to give the feeling of the characters being in different places. We love the little phone with his blinking red nose. Great job! Read more comments about Lexi’s winning look in our Top 2 & Bottom 2 article. Lexi will receive an arsenal of pro must-haves from SuperNail, including acrylic kits and accessories, nail art appliqués, and an assortment of ProGel shades, plus a UV Lamp (approx. value $560). The nail tech who is packing up her paintbrushes this week is…Lavette Cephus. Lavette, we love your story about hard work and dedication. We love that you have made a career for yourself doing nails, but you aren’t resting on your laurels. You are striving to better yourself every day. You are a very talented nail artist. Your skills in all mediums impressed us throughout this competition and helped you secure your place in the Top 4. During this contest, we enjoyed seeing everything you had to offer. Your video skills improved greatly from the beginning of the competition. And you were always the consummate professional. We loved having you in the competition and we will miss seeing what you have to offer. You should be proud that you made it into the Top 4! We look forward to so much more from you in the months and years to come. This won’t be the last time you hear from Lavette. She will move on to CND’s Last Chance Design Lab where she’ll have one last chance to stay in the competition. Check back next Friday to see who will move on in our Last Chance battle — Lauren or Lavette. Tune in Monday to find out the Week 10 Challenge and vote for your favorites! Good luck to our FINAL THREE: Danielle, Lexi, and Simone.